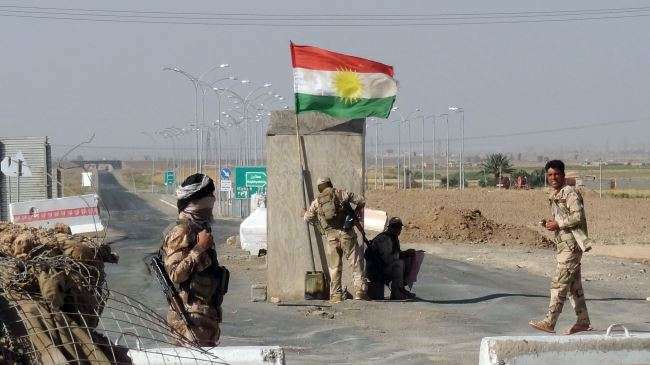 When the attacks in Shingal erupted and Daesh snipers and technicals began firing on a Peshmerga checkpoint on the main highway leading into Shingal from the west (Syria), a Peshmerga on duty stumbled back and forth across the road, returning sporadic small arms fire. He was so caught off guard by the enclave of rounds that he began reloading in the middle of the road without any cover. It didn’t take long for Daesh’s guerrilla tactics to overtake the checkpoints the Peshmerga had in place. autonomous country that already needed to be supplied. 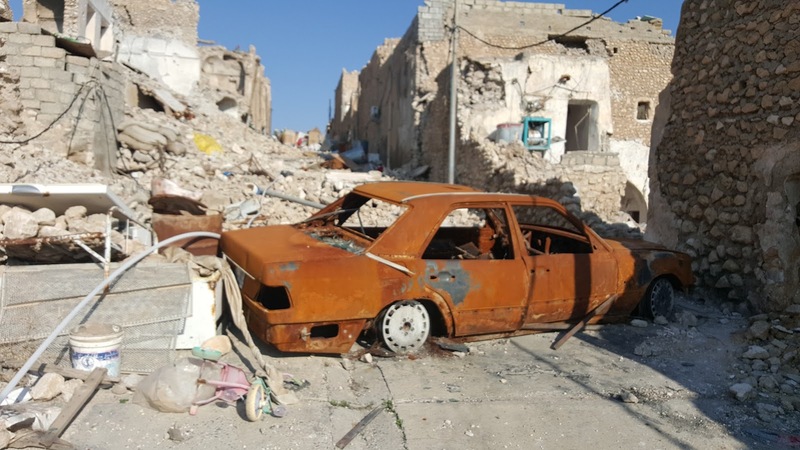 Within the first day Daesh had carved itself into the city, slaughtering men and taking women and children into captivity. The populace was attempting to flee into the mountains though, to their surprise, so were the Peshmerga. Some estimated close to 2,000 Peshmerga were in and around the city at the time of the attack, that is, until they decided to flee. This was not and would not be the only time Peshmerga troops fled from battle when they had the upper hand numerically. This is widely accepted knowledge amongst Kurds in Kurdistan (including many Peshmerga I’ve met). I spoke with many Ezidi families on Mount Shingal who were unaffiliated with any political party. I was told that Peshmerga troops closed off checkpoints to the civilian Ezidi populace attempting to flee so as to ensure that they evacuated their own vehicles, equipment and soldiers stationed on the roadways first. It was during these initial events that two other armed groups came to the civilians’ aid. The PKK (Kurdish Worker’s Party) arrived within the first week of fighting and started evacuating citizens up to the mountain. The PDK and the PKK are generally hesitant of each other, but often find themselves battling Daesh on the same front lines side by side. The PKK and allied YPG (People’s Protection Units) battled throughout the city taking back large swaths from Daesh in an attempt to delay them from attacking the populace. When the Ezidi populace saw how the Peshmerga fled, they abandoned any semblance of hope they had for their assumed protectors. 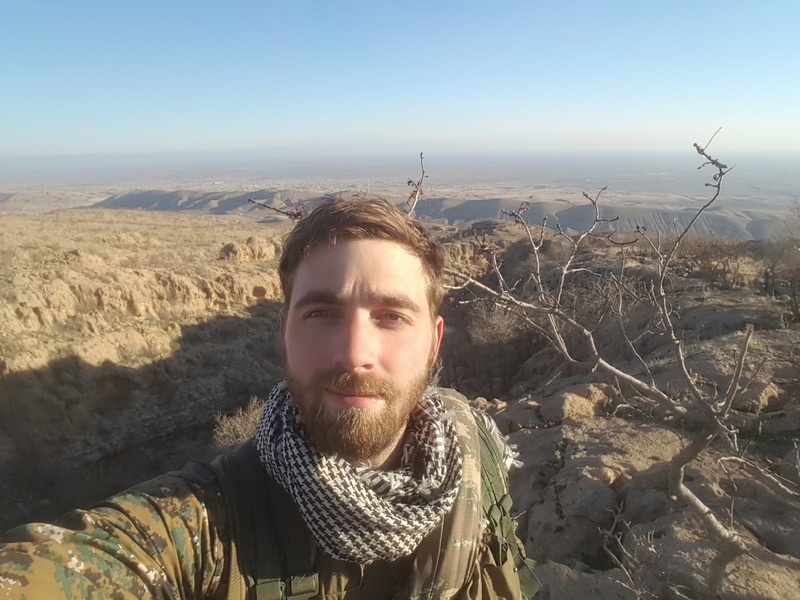 After the PKK and YPG established a perimeter using mountainous guerrilla tactics they immediately began training and establishing a new sect of their militia. This group would not fall under any Peshmerga, PDK or PKK umbrella. They were their own entity compromised of Ezidi and a few outsiders who fought for the same ideology as the YPG. A YBŞ enlistment ceremony. These men will pledge their entire lives to the cause. 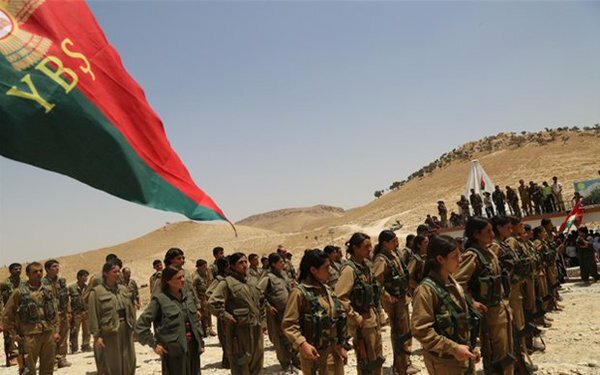 Even with the respects paid to the dead, and the fact that the YBŞ had been fighting for nearly a year before the “Liberation of Shingal” in the fall of 2015, the PDK and Barzani himself denied any credit to the YBŞ, YPG, or PKK who were all involved in intense urban combat for almost an entire year prior. The Peshmerga came into the city and faced little resistance, mainly clearing IED’s. In the midst of American airstrikes almost all Daesh fled utilizing burning tires and oil to create a thick black smoke, thus creating a dense cover to avoid being spotted from above. The YBŞ had nearly driven Daesh completely out of the city before the PDK and PUK (the other half of Peshmerga, who are often underfunded and denied any credit by Barzani) came in and started waiving flags everywhere. The denial of any forces other than the PDK arose in PDK funded media such as Rudaw. The following French documentary shows much of the fighting mentioned. It strays into some other areas but it clearly shows that YBŞ and PKK soldiers were fighting to take back the city far before PDK forces had decided to come back and “retake” it as PDK/KDP funded media outlets so proudly proclaimed. The YBŞ are an ideologically motivated group. Most retain their Ezidi faith but they fight for something more. Their society is based on direct democracy (democratic confederalism), gender equality and self sustainability. They fall under the PYD political party along with the YPG. Basing themselves on a Murray Bookchin-styled libertarian socialism, they follow the same belief systems as the YPG and have formed many parliaments and counsels in their province following a form of small government that is based primarily on various parliaments held by both man and woman chairpersons. Their form of democracy promotes freedom of religion, equality between races and genders and a strong affinity for anti-corruption. Many of these concepts are unacceptable practice within their surrounding nations. Although the Ezidi are a religious community, they do not promote their religion. It is against the Ezidi faith to allow anyone not born into Ezidism to become a member. It is also forbidden to document their faith in writing, although foreigners have attempted to do so. A document claiming to be the Black Book (one of two holy Ezidi verses) was released and is still presently online. This is not an accurate text, but rather an attempt by British cultural explorers to explain the traditions and customs of the Ezidi people during the 1960’s. The Ezidi faith does not allow written documentation of their verses. Instead, they are memorized by select elders and passed down generation through generation in a verbal manner. Many members of the YBŞ are Ezidis from countries outside of Kurdistan. The leader (who will remained unnamed until he gives permission otherwise) comes from Russia and served in the Russian military. I met men from Georgia, Germany, Armenia, Iran and many other places. There are also a smaller number of those sympathetic to the Ezidi cause who do not belong to the faith but had joined the group, including myself and one other American. Myself, another American, and multiple members of the YBŞ, including a few from foreign countries. The YBŞ focuses on ideological teachings as much as they do tactics. 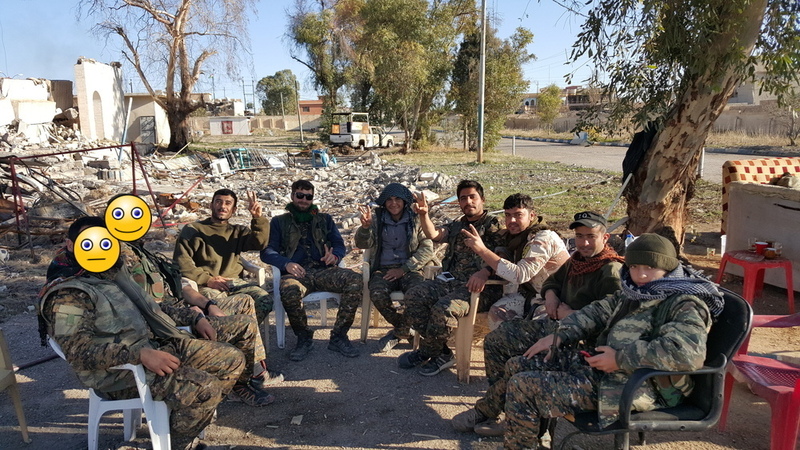 They believe that the only way to prevent a soldier from running away from the enemy (Daesh or otherwise) is strength in their beliefs and a firm understanding of what they could be killed for. Given that this latest genocide is largely the fault of Barzani’s Peshmerga fleeing, this concept is not taken lightly. 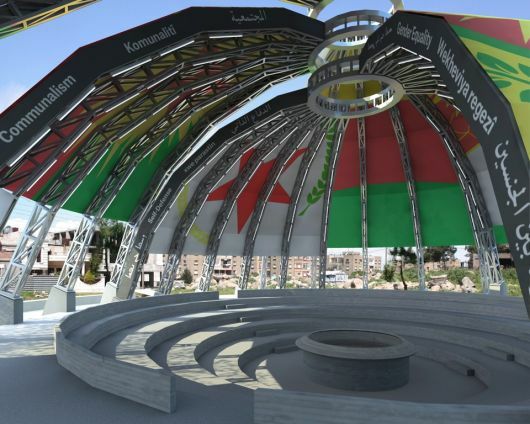 The Martyrs are respected with multiple memorials, including one that was approximately the size of a movie theater and positioned at the base of Mount Shingal. It is impossible to drive from one end of the mountain to the other (on roads) without witnessing this massive monument. One of the YBŞ’s main goals is to retrieve the Ezidis held captive by Daesh. They have been fairly successful given the circumstances, obtaining close to 150 (as far as I’ve been told by the date of this post). 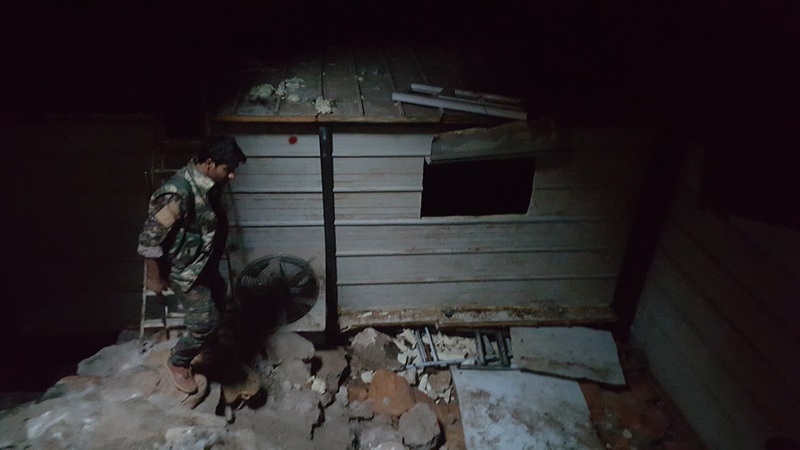 In many of the areas they take back from Daesh there are caves found, much like the one shown below, where Ezidi women and children are held as captives. This cave shown below would never have been found without a thorough sweep of the area. It was almost undetectable, having an opening no bigger than 3’x3′ camouflaged by the desert above it. In the YBŞ it seems as though there is always a meeting to go to. During these daily meetings members express concerns and everyone gets a chance to be heard. Often referred to as “critique”, these expressions are an expected and beneficial feature. Such meetings are not for the thin-skinned. Any offense felt by those being critiqued is not commonly voiced as such is strongly frowned upon. Sometimes members remind others of ideological principles. This is meant to be motivating and constructive. Occasionally (rarely, from my experience) the formalities of having to sit in a certain position and listen intently are pardoned, and it’s a time for jokes and a damn good laugh at the end of a hard day. After spending years in the US Army, working with Afghan militias and then the PUK Peshmerga, being surrounded with this kind of attitude during a time of conflict was beyond what I would normally consider as refreshing.